This is a region of particular interest. The lack of any features on the smooth region (lower left) implies a young surface. 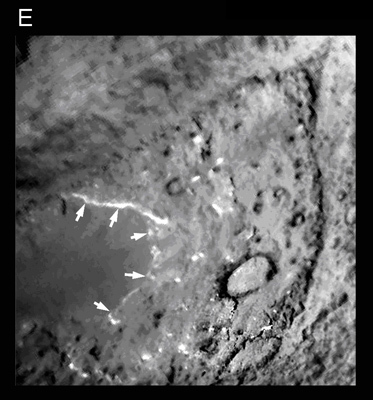 But is it advancing towards the right and covering up rougher, older surface regions? Or is it retreating to the left, eroding and uncovering those regions? The scarp edge marked by arrows is about 10-20 m above the lower and older terrain. It appears bright since it is catching direct sunlight.